Summer is coming, and we cannot wait to see everything God has in store for Christ Community Church! While some people throttle back during the summer, we mash the gas! To help keep our church engaged financially, we’re encouraging you to join our annual summer giving challenge from May 27 – September 2. 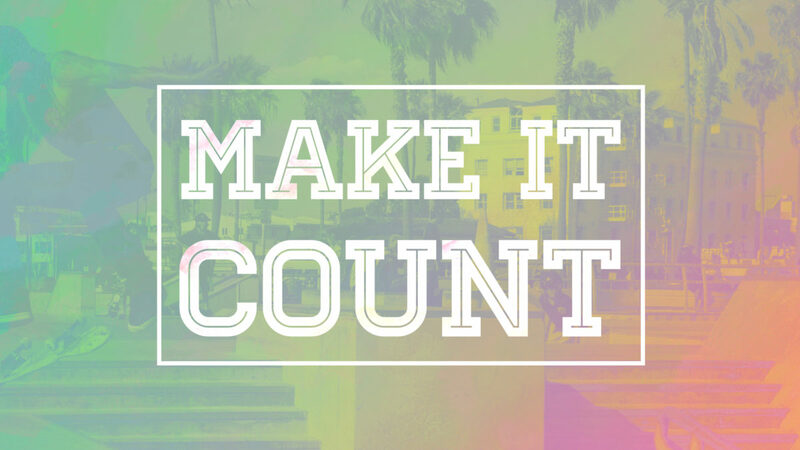 This year, we’re calling it Make It Count. We encourage you to make your summer count for Christ wherever you are. 1) Meet our Ministry Budget Goal of $417,000 during these fifteen weeks so we can operate at an optimum level. Therefore, we need God’s people to give a total of $435,000 during these fifteen weeks. If you are here all fifteen weeks, we encourage you to give faithfully. If you are out of town a couple of Sundays, please give before you go, through online giving while you are away, or make up your giving upon your return. A personal and worthy financial goal for each of us should be to give at least the first tenth of all God has given to us each week. Faithfulness is the goal as we steward God’s money and Make it Count this summer. One of the easiest ways to be faithful in your giving is to set up recurring giving so whether you are here or away, your giving continues. Together, we can reach this goal of $435,000. It comes down to each one of us giving weekly and honoring God with the first tenth of all He gives to us. Join Marci and I in this journey! Let’s do it for God’s glory! Here’s a list of things you can join us in praying for. Keep these needs before you. Print them out to remind yourself to pray for these things daily. 1) Ask God to bless our summer Make It Count focus. Pray that our church family would be faithful, and God would meet and exceed our full budget need of $435,000. 2) Isaiah 64:1 says, “If you would tear the heavens open and come down!” Ask the Lord to come down upon each of our Sunday worship services this summer. Pray that He would meet with us in a powerful way each Sunday, blessing us, empowering us with His Spirit, saving the lost, discipling the saved, and growing everyone in the Word of God and in faith. 3) Ask God to save, grow, and disciple children, students, and adults through VBX, Student Camp, mission trips, and Love our Community this summer. The ministries of Christ Community are focused on seeing children, students, and adults reached with the gospel of Jesus Christ and grown into faithful disciples. I desire for each person in our faith family to focus their life on Jesus and his mission in order to move our Church forward. That’s the way the Kingdom of God grows and that’s the way a Church grows! Finally, the vision of Christ Community Church is “Making gospel-centered disciples among all people for the glory of God.” This is not my vision, but our vision. We cannot accomplish this vision without you! Your involvement in praying, serving, going, and giving is critical to our mission. Gear up, Church! Let’s pray. Let’s give. And let’s go for the glory of God. We’re in this together, and God has great things ahead. I can’t wait to see how he uses us this summer!